Yikes! That's a lot of babies! How fun. that is awesome. I see a lot of skin and i assume a lot of sun tan lotion. Fun times!!! Looks like a blast. Wow that is a lot of boys! Y'all will have lots of stories to tell if you remain friends til they are teenagers. haha! I gotta get a slip n' slide...so fun! Chaos, yes, but fun chaos! Looks like chaotic fun. I love the group picture at the top. 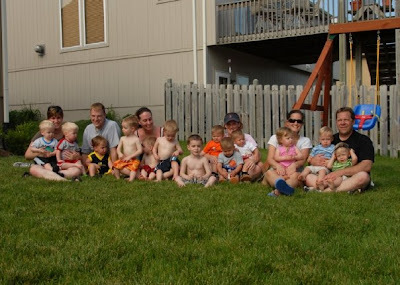 That is a lot of kids! One girl! Too bad we didn't live near you all. My girls would have had a blast - looks like sooo much fun.